The Gwich'in people live in a vast area extending from northeast Alaska in the U.S. to the northern Yukon and Northwest Territories in Canada. Oral tradition indicates that the Gwich'in have occupied this area since time immemorial or, according to conventional belief, for as long as 20,000 years. 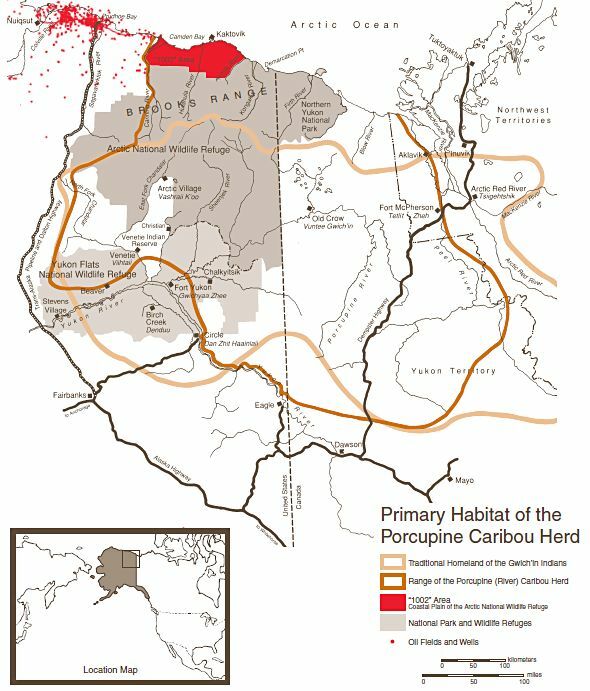 The Gwich'in life and culture have traditionally been based on the Porcupine Caribou herd, the people's main source of food, tools, and clothing. Fish and other animals supplement their diet. The Gwich'in practiced a nomadic lifestyle until the 1870's, when fur traders came into the area to establish forts and trading posts that later became settlements. Approximately 9,000 Gwich'in currently make their home in communities in Alaska, Yukon, and the Northwest Territories. The Gwich'in people comprise the following nations in the Northwest Territories, the Yukon Territory and Alaska. Vuntut Gwitchin is the name of people who live in the settlement of Old Crow, Yukon. Their name in the Gwich'in language means "people of the lakes." Old Crow is the northernmost Yukon community, located 128 km (80 miles) north of the Arctic Circle at the confluence of the Crow and Porcupine Rivers. The Gwich'in communities in the Northwest Territories are located in the region of the Mackenzie Delta. These communities are organized under political bodies that include bands created under the Indian Act and the Gwich'in Tribal Council, as mandated through the negotiated Land Claim Settlement Agreement. These are the Gwich'in communities in the Northwest Territories. Fort McPherson (Teetl'it Zheh) Teetl'it Gwich'in identifies the Gwich'in who live in the settlement of Fort McPherson, which is situated on the Peel River in the Northwest Territories. Teetl'it Gwich'in means "people of the head waters. ".Fort McPherson was established in 1852 when Old Fort, a Gwich'in village, was moved from six kilometers upriver to the present town site. More than 80 percent of Fort McPherson is of Gwich'in descent, which makes this community the largest Gwich'in settlement in the Northwest Territories. The economy of the community is based on hunting, fishing, and trapping with some tourism activities. Tsiigehtchic Gwichya Gwich'in is the name of people who live in the settlement of Tsiigehtchic. Gwichya Gwich'in means "people of the flats." Tsiigehtchic is home to approximately 195 residents of which the majority are Gwich'in. Residents of this community still rely on hunting, fishing and trapping for food and income. Aklavik Edhiitat Gwich'in are the "delta people" who reside in Aklavik, a community situated on the Peel Channel of the MacKenzie Delta. Aklavik is an excellent trapping area, as well as a transportation center. The Delta, the Richardson Mountains and the local arts and crafts have also made tourism an important part of the economy. Inuvik Nihtat Gwich'in means "mixed nations," because this group is comprised of Gwich'in from various Gwich'in communities. The Nihtat Gwich'in reside in Inuvik, a community located on the East Channel of the MacKenzie Delta. Inuvik was founded in 1955 and serves as the administrative centre for the Western Arctic. The Nihtat Gwich'in rely on hunting, fishing and trapping, as well as other economic ventures. The Gwich'in in Alaska come from six communities to form one part of the Gwich'in Nation. Their communities are organized under bands with elected chiefs and councillors. The Council of Athapaskan Tribal Government is the political body to whom the chiefs report. In Alaska, the Gwich'in people from Arctic Village to Venetie are organized under state legislation known as IRA (Indian Reorganization Act). The Tribes are run by a Chief and Council who are all elected. The Council of Athapaskan Tribal Chiefs was created by the tribes in the Yukon Flats. Its purpose is to support the tribes in the Yukon Flats by providing a unified voice. The Chairmanship rotates between the Northwest Territories and Yukon every two years, with the region determining who will take on the chairmanship position. During the establishment of the Gwich'in Council International, it was decided that the Vice Chair would always be filled by a member from Alaska. Arctic Village Arctic Village is situated on the east fork of the Chandalar River, 100 miles north of Fort Yukon and 290 miles north of Fairbanks. The Neets'aii Gwich'in, meaning "residents of the north side," are people who reside in Arctic Village and lead a subsistence-based lifestyle. Caribou, moose, sheep, porcupine, rabbit and ptarmigan are hunted. Freshwater fish, waterfowl and berries are also harvested as a supplementary source of food. Until the 1950's, the Neets'aii Gwich'in lived a highly nomadic life. During this time they traditionally used seasonal camps and semi-permanent settlements such as Arctic Village, Christain, Venetie and Sheenjak in pursuit of fish and game. Birch Creek Birch Creek village is situated along Birch Creek approximately 26 miles southwest of Fort Yukon. The Dendu Gwich'in, "foothill mountain people", reside in this village and actively follow subsistence practices. Salmon, whitefish, moose, black bear, waterfowl and berries provide most of the food sources for the Dendu Gwich'in. Chalkyitsik Chalkyitsik, which means "fish hooking place," is located on the Black River about 50 miles east of Fort Yukon. The community has been an important seasonal fishing site for the Gwich'in. Chalkyitsik is home to the Draan'jik Gwich'in, meaning "Black River Indians," who have lived a highly nomadic lifestyle. They lived at the headwaters of the Black River from autumn to spring, then moved downriver to fish in the summer. Chalkyitsik is a traditional Gwich'in community with a subsistence lifestyle. Circle Circle is located on the south bank of the Yukon River at the edge of the Yukon Flats, 160 miles northeast of Fairbanks. The Danzhit Hanlaih Gwich'in, meaning "water flowing out of the mountains,",live in Circle, Alaska. They rely on a subsistence lifestyle: salmon, freshwater fish, moose and bear are the major sources for meat. Trapping and the sale of handicrafts contribute to family income of the Danzhit Hanlaih. Fort Yukon Located at the confluence of the Yukon River and Porcupine River, Fort Yukon is about 145 air miles northeast of Fairbanks. Fort Yukon is home to the Gwich'yaa Gwich'in, or "people of the flats." The Gwich'yaa Gwich'in rely on subsistence foods such as salmon, whitefish, moose, caribou, bear and waterfowl as their meat source. Trapping and the sale of handicrafts provide cash income to the Gwich'yaa Gwich'in. Venetie Located on the north side of the Chandalar River 45 miles northwest of Fort Yukon, Venetie is home to the Gwichyaa Gwich'in, or "people of the flats." This village was founded by a man named Old Robert who choose Venetie because of the abundance of fish and game. Venetie is also home to descendents from the Neets'ai and Dihaii Gwich'in. The Gwich'in who live in this community are dependent on subsistence harvesting of salmon, whitefish, moose, caribou, bear, waterfowl and small game for meat sources. As a member of the Athabascan (Gwich’in) tribe of the “Venetie Indian Reserved” of 1.8 million tribal lands located south of the brooks range in the northern interior of Alaska, our way of life is to respect the mother earth and it’s animals. When a hunter is given an animal, he is to pray for thanks to our great creator with upmost cleaness of the meat and weapons.